It was a rainy Sunday in the “State for Lovers”, but the perfect weather to venture underground. 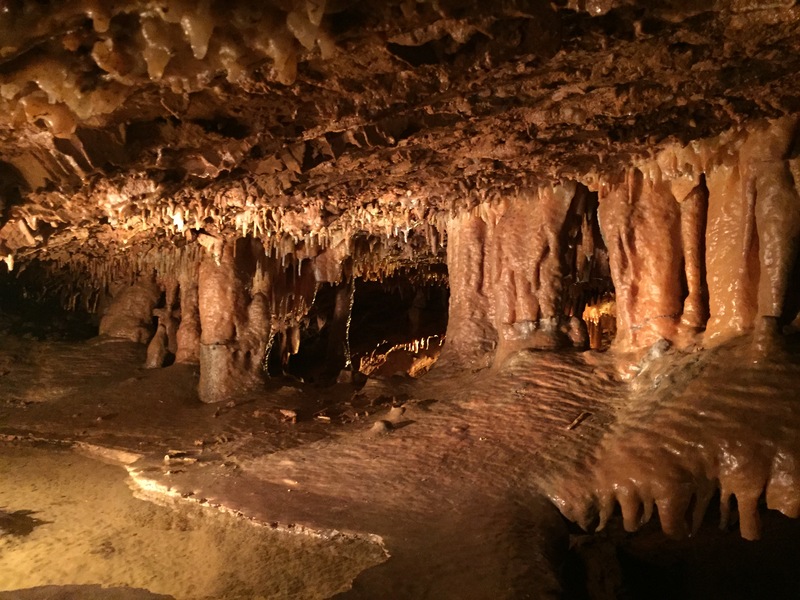 Today, we explored the Dixie Caverns, a limestone solution cave located in the Riverside Community of Roanoke County, Virginia. According to legend, the now commercial attraction was discovered in the early 1920’s by two young boys who ventured into the cave to find their lost farm dog, with only the light of their lantern as a guide. Three years later, the cave opened to the public. Once inside, we purchased our tickets and explored the rock mineral fossil shop as we waited for our tour to begin. In the meantime, I found a furry friend! At four o’clock, we followed our tour guide, Heather, into the cave. 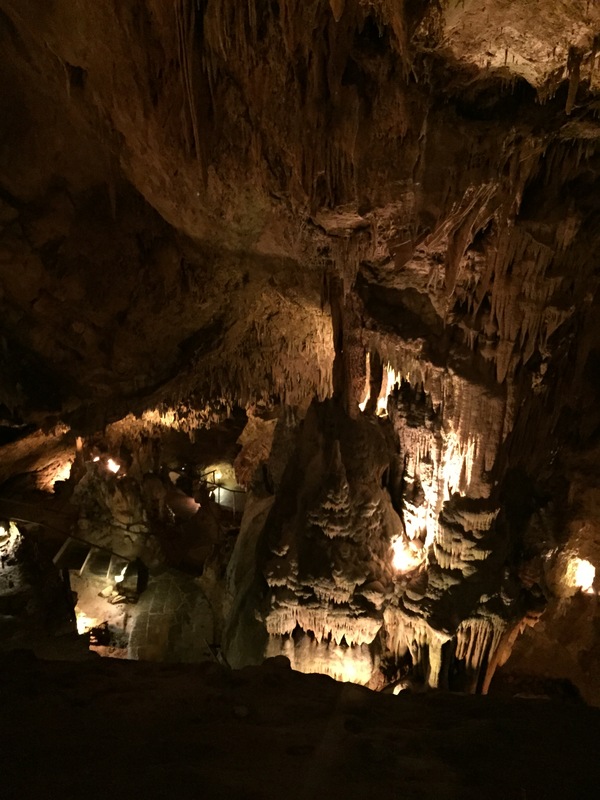 We were greeted by large stalactites stretching from floor to ceiling, massive formations molded “one drip at a time” by mineral-laden water falling from the ceiling. Amazingly, we were informed that one inch of growth represents eighty to one hundred years in the making. 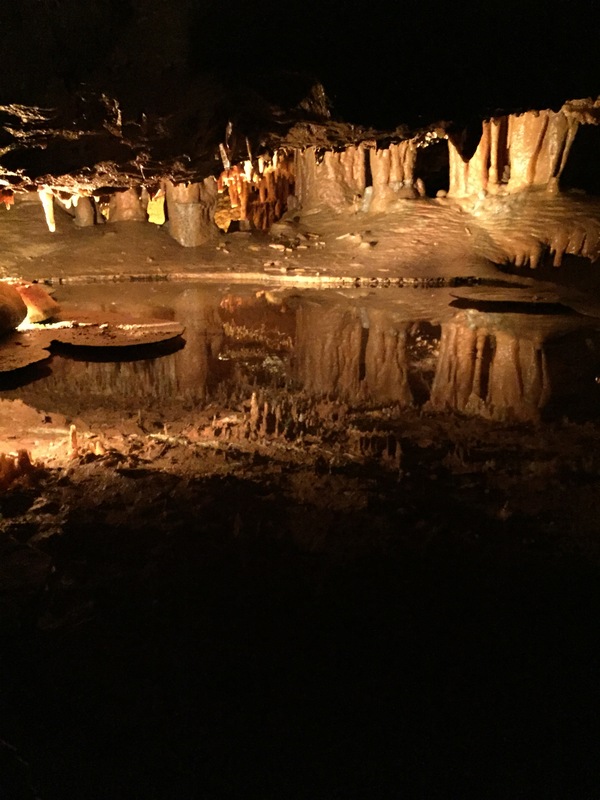 We passed by and, oftentimes, crawled through, several of the cavern’s infamous formations, including the Wedding Bell, Fairyland and, of course, the Magic Mirror (pictured below). This is a pool of mineral water which reflects the surrounding structures on its surface. We climbed a total of three hundred steps, beginning with the initial 48 dubbed “Jacob’s Ladder,” to reach the balcony at the highest point of the cave. As we gazed over the metal railing, what lied below wasn’t just an endless stretch of limestone, but evidence of many, many years of nature at its work. At the conclusion of the tour, our guide announced that the time had arrived for the grand finale. In other words, all of the lights in the cave would be turned off so that we can appreciate absolute darkness. The overhead spotlights flickered in warning and then, just like that, the room went black, leaving nothing but the soft exchange of our whispers in the darkness.